After watching Ken Burns' The Dust Bowl, a marvelously touching, illuminating and disturbing chronicle about the years-long, manmade environmental catastrophe that ruined a swath of the Great Plains in the 1930s, you will likely learn that your understanding of that American epoch is far less extensive than previously thought. At the beginning of the 20th century, the millennia-long evolution of the southern plains grassland ecosystem was eradicated in mere years. Grasses were literally pulled from the ground to create farmland, grow wheat and maximize profit. When a drought hit in the early 1930s and stayed for almost a decade, the soil, which had once seemed a harbinger of success, became an adversary. As Ken Burns says, "The Dust Bowl was a heartbreaking tragedy in the enormous scale of human suffering it caused. But perhaps the biggest tragedy is that it was preventable." 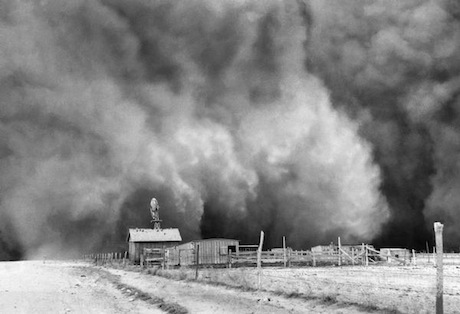 This documentary, a four-hour series that aired on PBS, details the dust storms that affected the people living in the geographic Venn diagram of disaster known as The Dust Bowl as well as the government response spearheaded by the earnest FDR. Burns uses film footage and photographs (the latter perhaps too repetitively and pointedly) to visualize these incomprehensibly dark days. But his most powerful documentary allies are the survivors who give evocative and emotional interviews—their words and memories become all the more resonant given their age and the recognition that when they die our connection to that era will be further removed. Through these interviews, the filmmaker fleshes out the daily life during what seemed a modern plague: hordes of jackrabbits, dust pneumonia, droves of grasshoppers, days darkened like "two midnights in a jar" thanks to monstrous dust storms that would block out the sun and make the most basic of physiological processes—breathing—a battle. Some who lived in The Dust Bowl wondered if God were punishing them for making the land bow to human will. If watched in one go, some might find The Dust Bowl a little dry, while others might take issue with either the occasionally uneven editing or Burns' now familiar style of documentary filmmaking. But watched as a mini-series, perhaps enjoying an hour a night for four nights, the documentary is captivating. You will be surprised by how much stranger life is than fiction. Special features include deleted scenes, additional interviews and interesting behind-the-scenes footage detailing the arduous search undertaken to find documentation and survivors of the dust storms.